I think they still do “I Spy” books. In the days before the internet, such things were important sources of information. 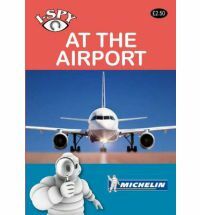 One of my favourites was “I Spy at the Airport”. I was not interested in tail fins and fire engines, but I thought one day I could be a hostess and jet around the world. One of the things not featured in the book was the automatic car park payment machine. Today I drove to La Rochelle to collect a guest from the airport. I paid the fee and returned to the car to see a British tourist break my car mirror by trying to lift a suitcase through a gap. I approached as the offender tried to twist it to some better shape. She did not realise it was my car. “Don’t know what happened there.” She quipped. I looked at her with curiosity. She did not look as if she suffered from any sensory issues. “You broke it with your suitcase.” I said. She was with a few quite well to do Anglos who hurumphed and looked at me with that superior “how dare you” expression. They quickly bundled themselves into their brand new Mercedes E class and shot off when they realised it was my car. Sometimes I really don’t like people. However, I got the mirror casing and managed to refit it – albeit a bit wonkily. Gilles will fix it I’m sure. The outcome of all this shamozzle was that I lost the ticket to exit the car park. I then put the car keys on the roof of the car, forgot where I put them and thought I had lost them. I went to the airport security and told them I had lost my keys. They took my phone number. I returned to the car and saw the keys on the roof. Much relieved I went back to the car park machine and pushed the enquiry button. SILENCE. I decided to see if there was a talk your way out of jail button on the exit barrier or if I could tailgate another vehicle before the barrier came down. There was a button. I explained my life story to a perforated grill which had slightly more personality than the folks who had broken my mirror. “Come to the Security Office”. Said the machine. I duly went. “You are the woman who has no car keys.” Said the guard. I think he was related to the machine because he sounded similar. “I’m sorry – I found them.” Several guards shrugged but looked friendly.”What is your name?” He asked. I told him…..and waited…..NOT A SINGLE GLIMMER OF RECOGNITION. Perhaps French security officials do not read Romantic stories for ladies written in English. “Go to your car and go…” He said. I drove to the barrier. I spoke to the perforated grill. It shrugged and the barrier rose. I rejoined the World. I must re-read some Kafka. A neighbour sometimes looks after a baby – well a toddler. The child smiles – deeply and joyfully. It is a profound talent. Please World – let her exercise and keep her gift. It’s 34 degrees and I’ve got the oven on to cook an English Sunday Roast. Mad dogs and Englishwomen roast in the midday sun. My guest brought me some English Bisto gravy granules. Back to the moules tomorrow. Emma thinx: Break my car mirror – 7 years voodoo. This entry was posted in Cars, Emma Calin, Food, France by emmacalin. Bookmark the permalink.